Adam LeBor (on the group weblog Harry's Place) asks the right question here: Guardian or Der Sturmer?. This disgusting cartoon could easily have come from some neo-Nazi rag (or from an anti-semitic newspaper somewhere in the Arab world), but in fact it appeared in Britain's leading left-liberal newspaper, The Guardian. And it's not even surprising to see it there. Further commentary seems almost superfluous ... except that this is one more sign that when it comes to certain issues, something has gotten totally unhinged in the world-view of wide swathes of public opinion in Britain--and not only in Britain. 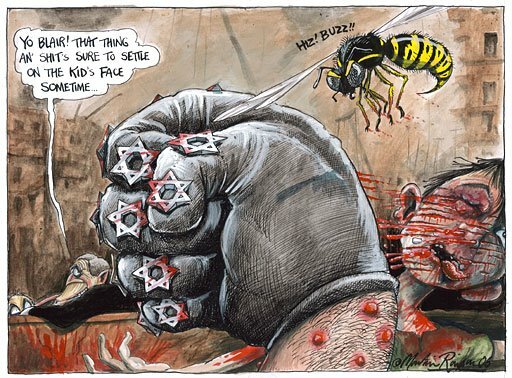 => In a note the next day, the Guardian said it was surprised to discover that some readers saw this cartoon as anti-semitic (why would they think that, I wonder? ), but explained that it was merely intended to demonize Israel. (For the weasel-worded phrasing they actually used, see here.) Adam Lebor comments: "Oh well, that's all right then." Actually--and this is what I suspect LeBor meant--in some ways this 'explanation' was even more sick, and more unintentionally revealing, than the cartoon itself.